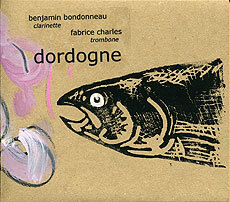 Benjamin Bondonneau, clarinet, field recordings; Fabrice Charles, trombone. Recorded Autumn/Winter 2006 the length of the Dordogne. Painting and graphic conception (front cover reproduced above) by Benjamin Bondonneau. Produced in a limited edition of 1,000 copies.